In late November, the International Labour Organization (ILO) in collaboration with the World Bank published the monitoring results of the use of child and forced labour during the cotton harvest in 2015 in Uzbekistan. The experts of the ILO, as the report says, «could not find conclusive evidence which can prove child or forced labour was used during the cotton harvest season in 2015 in Uzbekistan». At the same time, the report says: «There are risks of forced labour associated with the organized involvement of adults for cotton harvesting». These results raise the question on the honesty and professional integrity of those who conducted the study and came to this conclusion. In early 2015, the World Bank had approved loans to Uzbekistan worth 500m dollars for projects aimed at the development, modernisation and diversification of agriculture. Human rights organisations, especially the Coalition «Cotton Campaign», which bring together more than 30 international organisations, trade unions and business, demanded that the World Bank not allow the use of forced labour in areas where bank projects are being implemented. Under pressure from human rights activists, the Bank agreed to invite an independent audit organization that would conduct a study on the subject of forced labour in the agriculture sector of Uzbekistan. But instead of inviting an independent third party to audit, the World Bank signed an agreement with the International Labour Organization - a body of the United Nations, which can only work in conjunction with the government. Thus, the government of Uzbekista! n and the IL! O have come to a loving agreement for joint monitoring. The word «joint» in this case is crucial to determine the degree of «independence» of the whole event. Uzbekistan allowed the ILO officials to drive through the fields during the cotton harvest season in 2015, to visit various institutions, and conduct surveys among people. This could be seen as a positive phenomenon, if it were not for substitution of concepts. Forced labour in Uzbekistan is organized by local authorities (public administration) by decree of the Prime Minister Shavkat Mirzijaev, which means that such monitoring, when the representatives of the same government are the second relying party, cannot be considered independent. In practice, this meant that the ILO had no right to conduct confidential interviews with cotton-pickers and generally with anyone else, without the participation of government representatives. Each audit team consisted of one official of the ILO and three t! o four local officials. According to the report, during the monitoring, over 10,000 interviews were taken. However, interviews taken in the presence of officials do not have much value, because it is Uzbekistan. It is a country where the level of fear from the authorities is total. It is not hard to guess that the teacher or nurse who came to pick cotton because of fear of being laid off will be afraid to talk about it in the presence of officials because of the fear of losing their jobs. Why did the ILO or the World Bank need such monitoring? In my opinion, the reluctance to recognise the systematic use of forced labour by the ILO and the World Bank is due to the fact that these organizations by any means and at all costs want to remain in Uzbekistan. If the ILO tells the truth that the Uzbek government authorises forced labour, and the World Bank in response suspends lending to the projects, these organisations will likely have to leave the country. Thus, the ILO and the World Bank are trying to outsmart the Uzbek government, playing a «good cop», hoping to change the situation through soft methods. In other words, by endless persuasion to behave «in a civilized way». So that to implement the so-called «country programmes on decent work in Uzbekistan», the ILO has received 10m dollars from the World Bank and it is obvious that the organization does not have much reason to create problems for itself that could lead to the closure of the programme. Ot! her UN agenc! ies - UNICEF, UNDP are operating under the same conditions in Uzbekistan. Projects, which are implemented by these organizations, may be useful for the country, but, as mentioned above, in this case, we are dealing with the substitution of the concept of «independence». 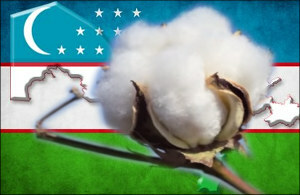 This year, the mobilization for the cotton harvest in Uzbekistan is characterized by special cynicism. The authorities were supposed to perform a complex task: to forcefully send a couple of million people to pick cotton and, at the same time to conduct a joint «monitoring of the use of forced labour with the ILO». That is, at first, to send people to pick cotton, and then to conduct a check on themselves. The main hope for success in this two-handed policy was to bet on the fear that makes people keep quiet. Those who decided to let in or not to let in the ILO officials, I think, were sure that people would not dare to criticise. And we must pay! tribute; they were not mistaken. Forced mobilization was accompanied by increased advocacy of the need to help the motherland to harvest cotton. A number of local organizations such as the Youth movement Kamolot (read - Youth Communist League), the «Nuroniy» fund, «Mahalla» fund, the Women's Committee issued a proclamation calling on the people to go pick cotton. The excitement of these proclamations is so high that an untrained person comes to the conclusion that the future of the whole country depends on the cotton harvest. The same concerns the acknowledgement of the desire to go and pick cotton, which en masse was written by students and civil servants. These acknowledgements were invented solely for the ILO experts, as an irrefutable evidence of voluntary participation in the cotton harvest. However, the authorities had to print and hang banners on the prohibition of forced labour and even specify their hotline number where one c! an call and complain. Obviously, wise Uzbek people realise! d that these banners along with the hotline numbers are not for them, but for someone else. As a school teacher said: «It's like schizophrenia.» «What is the point in complaining if cotton-picking is forced by the governor together with the local police and the prosecutor's office?» Thus, the illusory opportunity to complain to someone remained a fiction invented by eccentrics from international organizations. 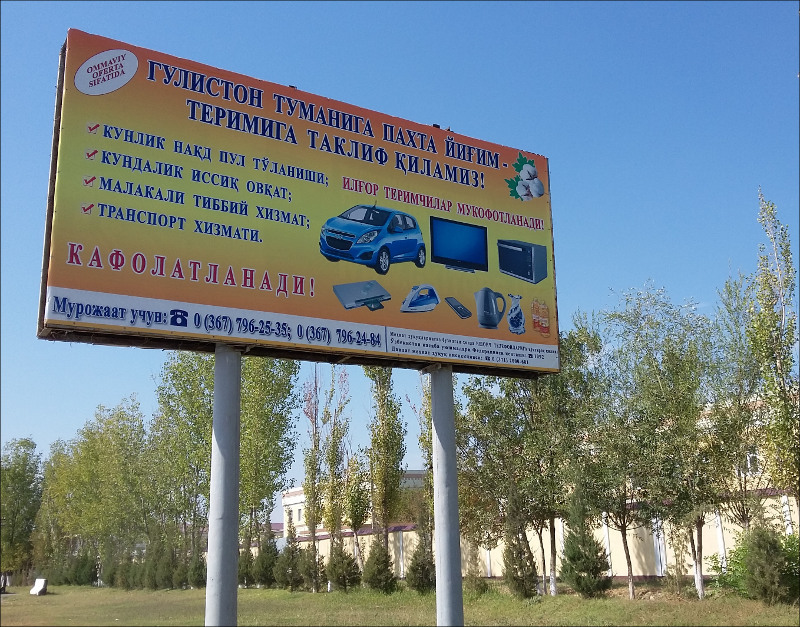 And in fact this is the usual standard for Uzbekistan - say one thing and actually do the opposite. The people from the Soviet era are used to doublethink and perform double power play. Only observers from the ILO could not see it and thereby proved its incompetence. The ugly system of cotton production in Uzbekistan, based on fear, extortion and coercion remains maintained. it is necessary to change the system, not because this is required by international organizations, but because it frees people from annual slavery, which corrupts society! and robs its future, and at the same time relieves the authorities of the need to lie to international organizations and ourselves. Umida Niazova, head of the organization «Uzbek-German Forum for Human Rights» [Berlin]. The organization holds an annual independent monitoring of forced labour in partnership with local activists.